This looks to be from the Hagenbeck-Wallace Circus. 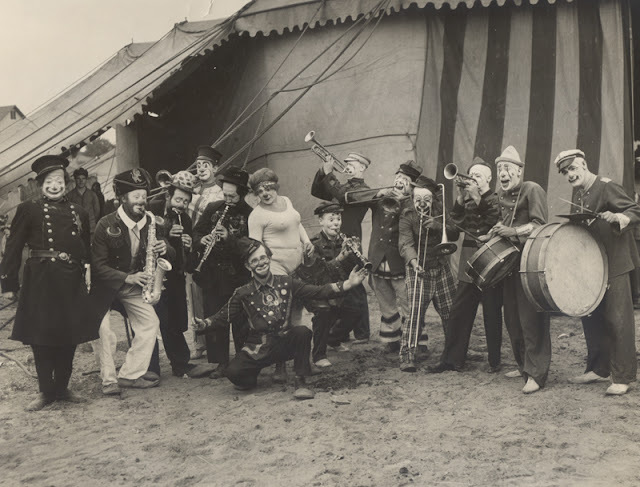 The clown cop on the far right is Jojo Lewis, next to him with the saxophone is Paul Jerome. Emmett Kelly is next to Jerome in the spotted derby. The tramp next to Emmett with the clarinet looks like he might be Mark Anthony but he's far too old to be. Behind them might be Roy Barret. Down front with arms outstretched is Jerome's pal, Bill Ward's uncle and longtime Ringling advance clown, Earl Shipley. The whiteface playing clarinet at Earl's left hand may be Frank Luley. The whiteface trombone player at the bell of Frank's clarinet is Horace Laird and next to Horace is Billy Rice. I'm not sure about the other whitefaces. I *am* sure that, in the center, that is Otto Griebling in drag.